A man has been apprehended in Bayelsa state for shooting his girlfriend in the face for allegedly cheating on him. The ugly incident reportedly happened in Oluasiri town in Nembe area of the State. According to Facebook user Igbogi, the man decided to kill the young lady just because he suspected her of cheating on him. He man pointed a gun at his girlfriend while interrogating her over the alleged affair with a man she was sighted with when the gun went off on her, destroyed her face and killed her in the process. 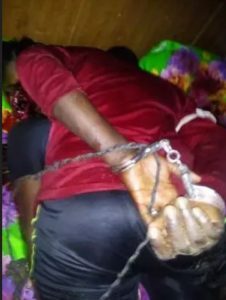 The ugly incident which happened around 11pm last night (Sunday) and the suspect has been handed over to the Nembe unit of men of the Nigerian Police Force for prosecution.